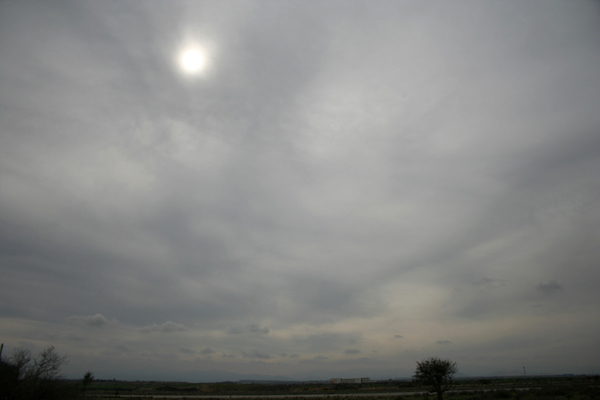 Stratus clouds are very low-level grey layers or patches of clouds with fuzzy edges. They are the lowest clouds and sometimes appear at ground level in the form of mist or fog. 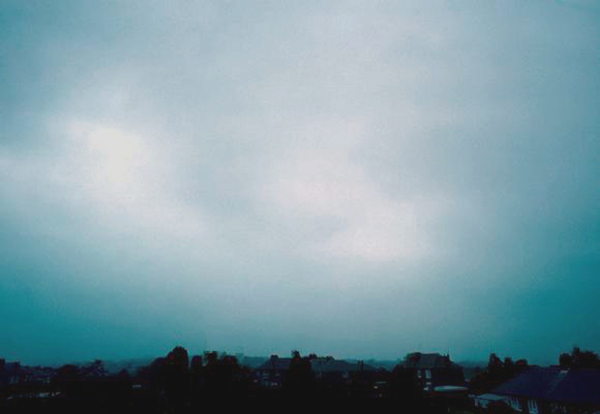 Stratus clouds are a fairly uniform grey or white colour and may be accompanied by drizzle, snow or snow grains. If there are no other clouds above the layer of stratus cloud, the sun or moon may shine through. Cumulonimbus are heavy and dense low-level clouds, extending high into the sky in towers, plumes or mountain shaped peaks. Commonly known as thunderclouds, the base is often flat and very dark, and may only be a few hundred feed above the Earth's surface. 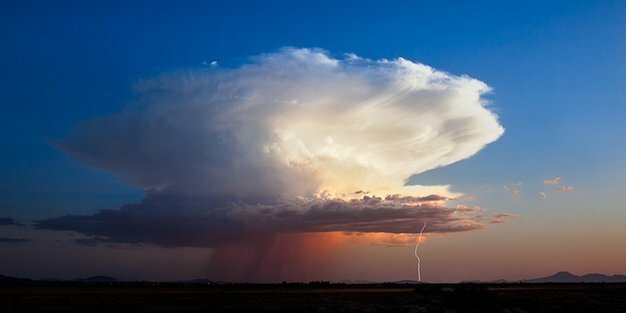 Cumulonimbus clouds are associated with extreme weather such as heavy torrential downpours, hail storms, lightning and tornados. 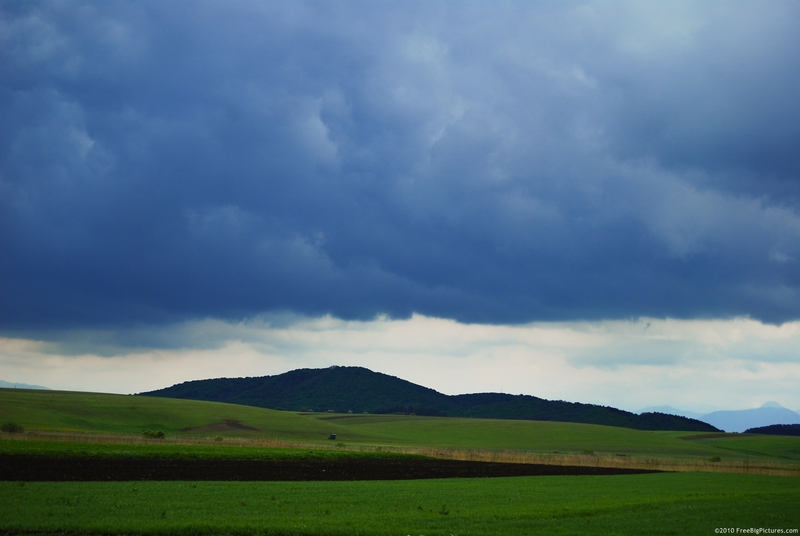 If there is thunder, lightning or hail, it's a cumulonimbus cloud rather than nimbostratus. 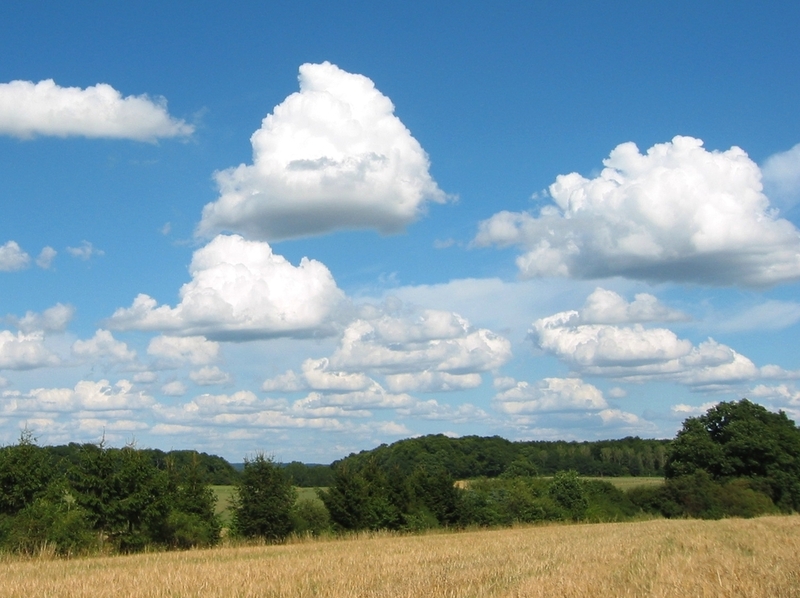 Cumulus clouds are detached cauliflower shaped clouds usually spotted in fair weather. If they get bigger they can sometimes produce showers. The top of these clouds are mostly brilliant white when lit by the sun, although their base is usually relatively dark. Low-level clumps or patches of cloud varying in colour from bright white to dark grey. They normally have well defined bases and some parts much darker than others. They can be joined together or have gaps between them. 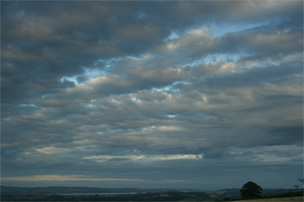 Stratocumulus clouds can be present in all types of weather conditions, from dry settled weather to light rain and snow. 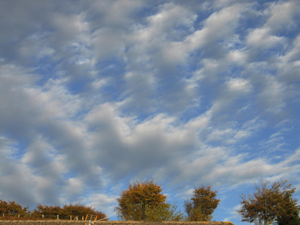 Altocumulus are small mid-level layers or patches of clouds - called cloudlets - in the shape of rounded clumps. These are white or grey, and the sides away from the Sun are shaded. Mostly found in settled weather, altocumulus are usually composed of droplets, but may also contain ice crystals. The presence of shading can help tell the difference between altocumulus and cirrocumulus. Cirrocumulus are white but altocumulus can be white or grey, and the sides will be shaded. 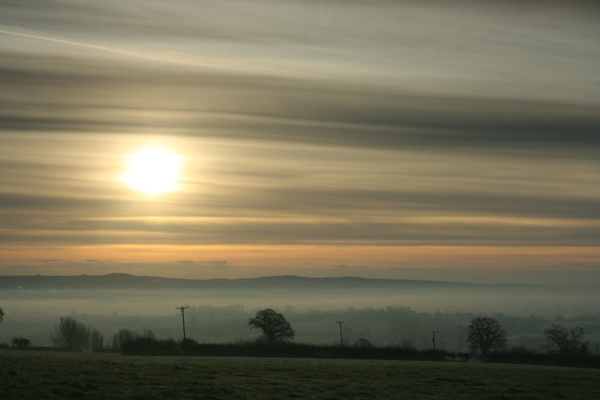 Altostratus are large mid-level thin grey or blue coloured clouds. Usually composed of a mixture of water droplets and ice crystals, they are thin enough in parts to allow you to see the sun weakly through the cloud. The sun cannot cast shadows when shining through altostratus clouds, which is how you can differentiate between altostratus and nimbostratus. They are spread over a large area - up to thousands of square miles - and they are either featureless or can have parallel stripes. Nimbostratus clouds are dark grey or bluish grey featureless layers of clouds, thick enough to block out the sun. These mid-level clouds are often accompanied by continuous heavy rain or snow and cover most of the sky. 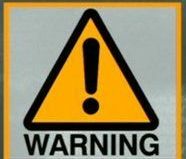 If there is hail, thunder or lightning it is a cumulonimbus cloud rather than nimbostratus. Cirrus are short, detached, hair-like clouds found at high altitudes. These delicate clouds are wispy with a silky sheen or look like tufts of hair. In the day time, they are whiter than any other cloud in the sky. While the sun is setting or rising, they may take on the colours of the sunset. Cirrocumulus clouds are lots of small white clouds - called cloudlets - grouped together at high levels. Composed almost entirely from ice crystals, the little cloudlets are regularly spaced, often arranged as ripples in the sky. They are relatively rare, and unlike altocumulus clouds, never have any shading. Cirrostratus are transparent high clouds covering large areas of the sky. They sometimes produce white or coloured rings, spots or arcs of light around the sun or moon that are known as halo phenomena. Sometimes they are so thin that the halo is the only indication that a cirrostratus cloud is in the sky. 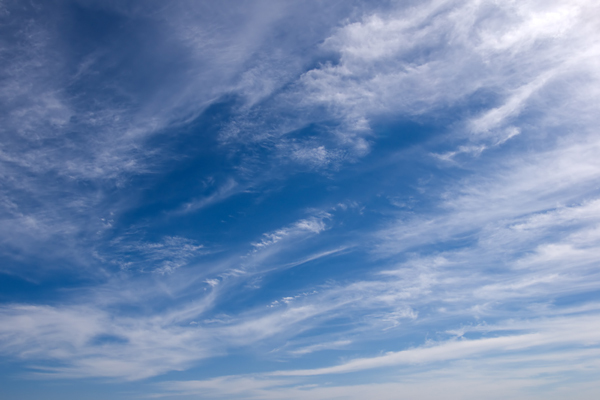 Cirrostratus can span thousands of miles, and may be smooth or fibrous and are often fringed with cirrus clouds. Shadows will normally still be cast by the sun when shining through cirrostratus clouds, which can help distinguish them from similar nimbostratus clouds.